AL REALIZAR EL PAGO POR PAYPAL ACEPTA QUE LOS DATOS ENVIADOS DE LA SOLICITUD ENCARGO PERSONALIZADO SON CORRECTOS. DEBE REALIZAR EL PAGO COMPLETO DE TODOS LOS PACKS DE EJERCICIOS DE LA TERAPIA VISUAL-ONLINE PERSONALIZADA ENCARGADA POR USTED. UNA VEZ REALIZADO EL PAGO, CUANDO RECIBIDA LAS CLAVES DE ACCESO Y COMPRUEBE EL CORRECTO FUNCIONAMIENTO DE ACCESO A SU PROGRAMA DE REHABILITACIÓN VISUAL, RENUNCIA AL DERECHO DE CUALQUIER RECLAMACIÓN, DISPUTA O RECLAMACIÓN DE CARGO POR CUALQUIER OTRO MOTIVO Y ACEPTA QUE DEBE REALIZAR LOS EJERCICIOS ANTES DE LA FECHA DE CADUCIDAD INDICADA. AL REALITZAR EL PAGAMENT PER PAYPAL ACCEPTA QUE LES DADES ENVIADES A LA SOL·LICITUD DEL ENCÀRREC PERSONALITZAT SÓN CORRECTES. HA DE REALITZAR EL PAGAMENT COMPLET DE TOTS ELS PACKS D'EXERCICIS DE LA TERÀPIA VISUAL ON LINE PERSONALITZADA ENCARREGADA PER VOSTÈ. UN COP FET EL PAGAMENT, QUAN REBI LES CLAUS D'ACCÉS I COMPROVI EL CORRECTE FUNCIONAMENT D'ACCÉS A SEU PROGRAMA DE REHABILITACIÓ VISUAL, RENÚNCIA AL DRET DE QUALSEVOL RECLAMACIÓ, DISPUTA O RECLAMACIÓ DEL CÀRREC PER QUALSEVOL ALTRE MOTIU I ACCEPTA QUE HA DE REALITZAR EXERCICIS ABANS DE LA DATA DE CADUCITAT INDICADA. WHEN MAKING PAYMENT BY PAYPAL, YOU ACCEPT THAT THE INFORMATION SENT IN THE REQUEST OF PERSONALIZED ORDER OF OUR WEB IS CORRECT. 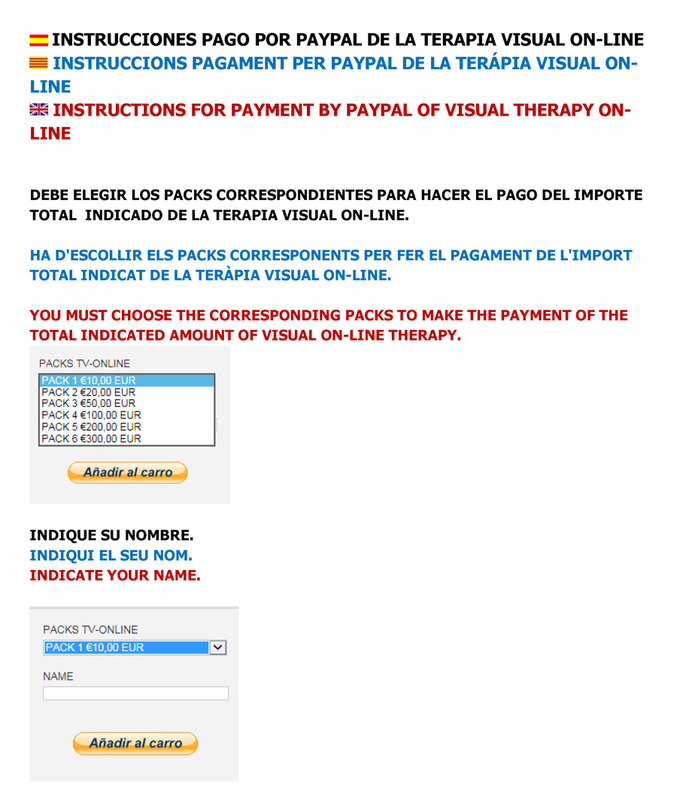 YOU MUST MAKE THE COMPLETE PAYMENT OF ALL EXERCISE PACKS OF PERSONALIZED VISUAL THERAPY-ONLINE THAT YOU ORDERED US. ONCE YOU MADE THE PAYMENT, AND YOU RECEIVED THE ACCESS CODES AND CHECK THE CORRECT OPERATION OF ACCESS TO YOUR VISUAL REHABILITATION PROGRAM, YOU GIVE UP THE RIGHT OF ANY CLAIM, DISPUTE OR CLAIM OF CHARGE FOR ANY OTHER REASON AND YOU ACCEPT THAT YOU HAVE TO MAKE THE EXERCISES BEFORE THE INDICATE EXPIRATION DATE.